Rub fish with salt and mix all the other ingredients, but cheese in a bowl. Dip fish into this mixture. If you have time you can leave fish in the mixture for 1-2 hours in the fridge. Preheat the oven to 400 F (200 C) and place the fish into a Pyrex dish. Bake for 20-25 minutes. After baking, you can also broil at low heat for 2-3 minutes for golden brown fish. Then sprinkle Parmesan cheese over the Basil Salmon and bake for 2-3 minutes (optional). 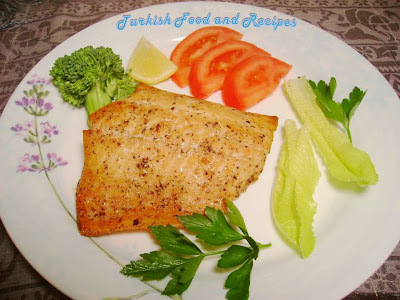 You can serve Basil Salmon with lemon wedges, vegetables and potato salad. Once tuzu elinizle ovalayarak baliklara yedirin. Peynir haric geri kalan malzemeyi bir kasede karistirin ve baliklarin her yerine bu karisimdan surun. Eger zamaniniz varsa baliklari bu malzemenin icine yatirin ve buzdolabinda 1-2 saat bekletin. Sonra borcam tepsiye baliklari dizin ve onceden isitilmis 200 C (400F) firinda 20-25 dakika, baliklarin uzeri kizarana dek pisirin. Firindan cikarip uzerine rendelenmis peyniri serpin ve 2-3 dakika daha pisirin (istege bagli). Feslegenli Somon Baligi'ni limon dilimleri, sebze ya da patates salatasi ile servis yapabilirsiniz.